The world’s largest heavy military transport aircraft in production conducted its first airborne mission this week with the Chinese military. 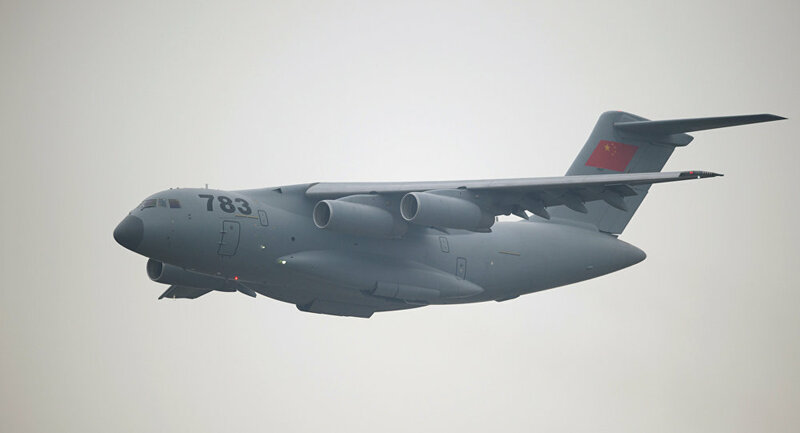 On Tuesday, a spokesperson for the People's Liberation Army air force announced that China's new Y-20 had conducted airdrop training with paratroopers, the Global Times reports. PLA spokesman Shen Jinke did not disclose when the first flight actually took place. ​But the announcement also coincided with pictures and videos emerging on social media channels showing the massive new aircraft. Some of the photos that have been posted on Chinese media sources such as Xinhua also show pictures marked "undated." ​The Chinese air force's "strategic capability should be in line with the constantly expanding national interests so it can carry out diverse military missions," the spokesman was quoted saying by the Xinhua news agency. ​According to Popular Mechanics, the Y-20 slightly edges out Russia's Ilyushin Il-76 as the largest heavy lift military transport aircraft that is actively being produced at factories. The US' C-17 is larger than the Y-20 when it is empty, but the production lines for the American heavy lift aircraft were shut down in 2015. The introduction of the Y-20 makes China the third major power to design and build a behemoth heavy lift transporter aircraft.